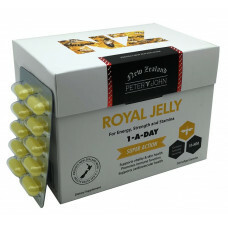 Buy Peter & John Royal Jelly 200 Capsules from Ashop. For enhanced dose take 2 capsules daily. All doses to be taken daily with food, or as directed by your healthcare professional. No added yeast, gluten, wheat, egg, dairy, soy, artificial colors, preservatives, flavours and sweeteners. Not to be taken during pregnancy or lactation. Royal Jelly may cause severe allergic reactions in allergy sufferers, including asthmatics. Keep out of reach of children. Store below 30°C in dry conditions. Do not use if tamper evident stickers are broken or missing or blister seal is broken. Use only as directed and consult your healthcare professional if symptoms persist. Go Healthy Go Royal Jelly 1000mg with 10 HDA 12mg 180 Capsules boosts energy, stamina, immune hea..